The toddler is actually asleep during the daytime. The six-week old is swaddled and staying asleep while not physically attached to me. At the same time. This is the first time this has happened in weeks. The adjustment to having two kids has been… about what you’d expect. We had our “babymoon” – two weeks that are easy not just because I have extra help, but because baby is clueless to the world around her. She’ll eat and sleep when she needs to, and as long as I keep her close and respond to her needs, she’s pretty undemanding. But pretty soon, she’s waking up. She starts moving her hands, which she uses to cluelessly bop herself away from her food source. She starts lifting her head, which she uses to keep herself from falling asleep on the comfort of my chest. She starts smiling, which distracts her from nursing. She starts straightening her strong legs, which she uses to keep herself from getting comfortable in newborn wrap carries. Isn’t it amazing how, from the very very beginning, we use every single tiny new power of independence to push ourselves away from what we need? From what we were made for? And from the very very beginning, someone with a lot of grace and patience has to be there, teaching us to use our powers for what is good, and what is good for us. M is a truly wonderful little baby. She’s at that peak stage of newborns-being-difficult, with her waking up to the world meaning that she is getting in the way of herself. And getting in the way of me helping her meet her basic needs. But she’s at the very easy end of such things, so I really have nothing to complain about. She’s thriving, all medical question marks have turned out to be false alarms, and we’re learning each other’s idiosyncrasies. The details of this dance of learning each other have been all-consuming for the past weeks. And will continue to be so; I expect continuous transition for quite a while yet. I got a surprising amount of knitting done during that first month, but the last two weeks have seen about five stitches. Even during those few moments that it’s been possible, I feel like just lifting the two ounces of sleeve and needles will make my arms fall off at the shoulders. Besides, I need to start showing my daughters the example that it is possible to rest sometimes. 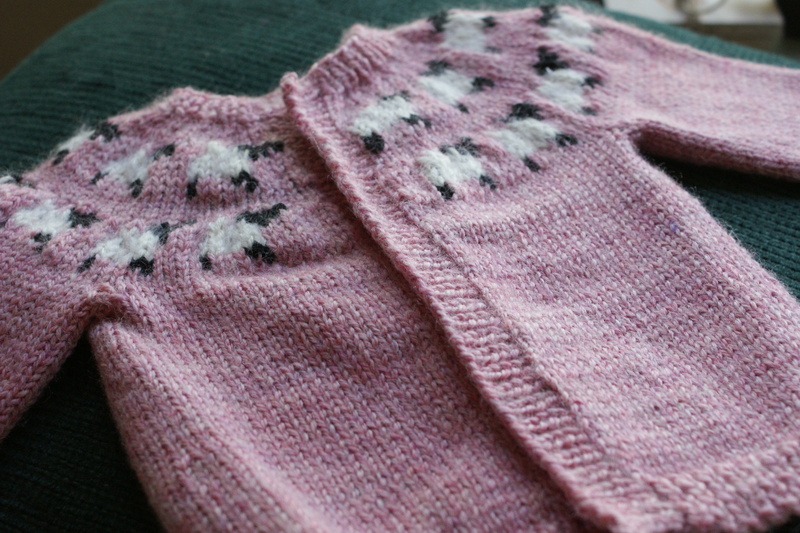 You can imagine my frustration, then, when I kept running into issues with the tiny sheep sweater. You see one sweater here, but I think I knit enough to have two of these already. The body of the thing (back and two fronts from bottom to armpits) I knit most of twice, because I completely misread the instructions for the decreases. The collar I knit twice as long as it was supposed to be before reading the directions and realizing it only had to be four rows long. The button band I managed to read the directions right, but when I bound off the first side, I realized it was unconscionably tight. I ripped it out and had to redo it with more stitches. The sleeves were fine. I was supposed to knit two of those. The sheep yoke… oh dear. I did a row of sheep, then ripped it out because doubling my contrast yarns was too thick. 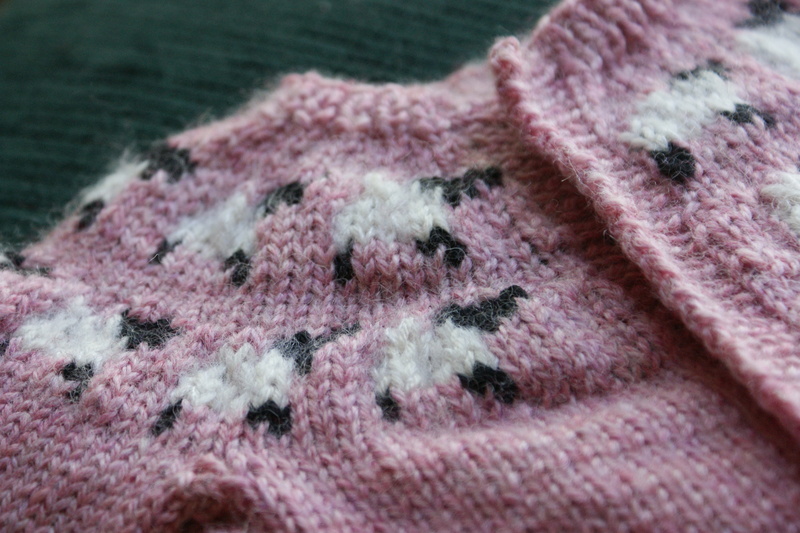 Then I did a row of sheep, decided doing the colorwork flat was making me insane, so I ripped back and added a steek. Yes, I am the sort of mad person who adds a steek to a pattern that does not have a steek. See, I have rules about fair isle knitting. (1) It should always be in the round. (2) you should never have more than two colors to a row. (3) you should keep long floats (6 stitches or more) to a minimum, since that means you have to catch the floats more often. This pattern broke all those rules, making it absolutely impossible for me to work fair isle with decent tension. So I got rid of one problem by adding a steek. Cutting and sewing down a little steek is easier than working this stupid maddening little yoke flat. Then I did the second row of sheep, and had to rip back because I’d missed the instruction for three extra rows between the rows of sheep. Though, after I finish the green sweater (hopefully without having to knit enough stitches for two more of them), I think my next project will be something nice and garter-stitch-y. At least until I’m getting a bit more sleep. So far so good, though I haven’t gotten past the sleeves. 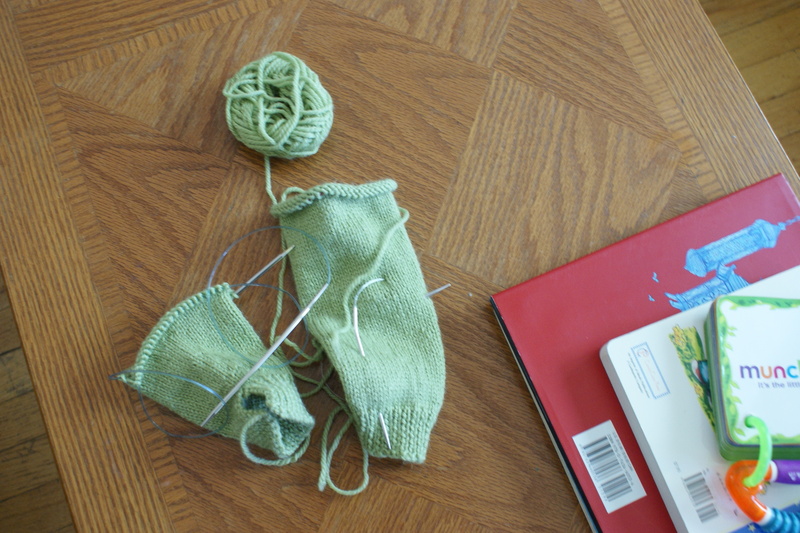 No, not much knitting time with a tiny kid. And this post, started during a naptime on Thursday, is now being completed on a Monday morning. But this phase shall past. And this little peanut is entirely worth it. 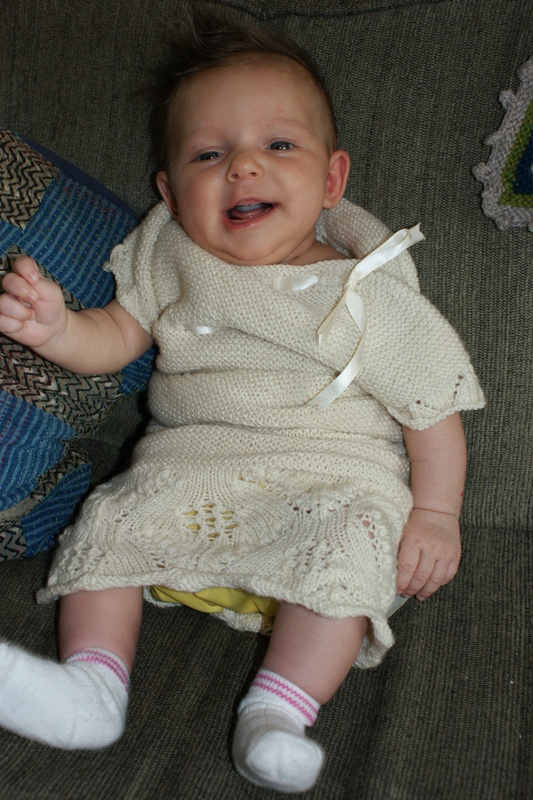 Nice job on the little ones sweater….Hard to knit when you don’t get enough sleep! Take care! Wow! I had no idea when I saw the sweater in person that it (and you) had been through such drama! It so cute, and Naomi will love it this fall.